Shipping included for all destinations. 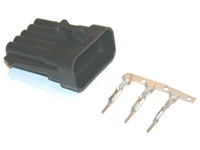 This is the 10-pin ALDL connector for use with the 1989-1995 Esprit. This connector allows you to plug your Freescan cable into the ALDL plug on your car.